Slaying orcs and dragons is hard work for heroes, so like all of us they deserve some vacation time at a nice resort. Epic Resort is all about running a place like that. Attracting heroes and showing a good relaxing time, but watch out the monster might attack your nice, epic establishment. What is Epic Resort like? 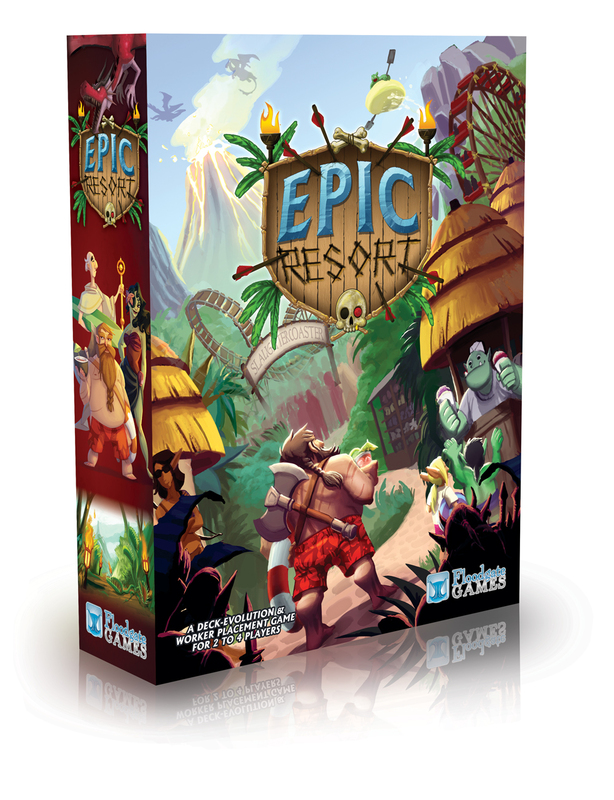 Epic Resort is all about showing fantasy heroes a good relaxing time and have the most epic (upgraded) attractions. These two things will score you points at the end of the game. Each player will start with a the same small deck of cards (representing your working staff). These worker cards are used for staffing your attractions and for training even better workers. 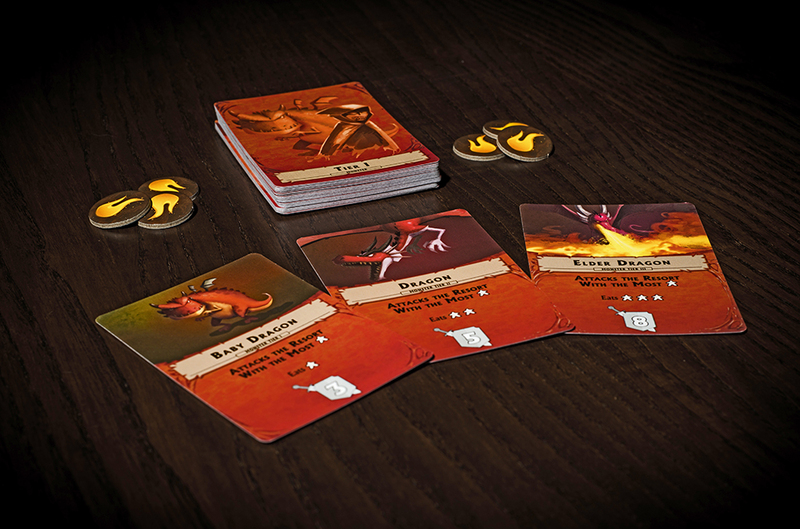 The game is played over several rounds (called seasons) and at the start of each of them you draw 5 cards from your worker deck. You then need to staff your attractions with the workers, and if you can’t tourists will leave your grand resort. 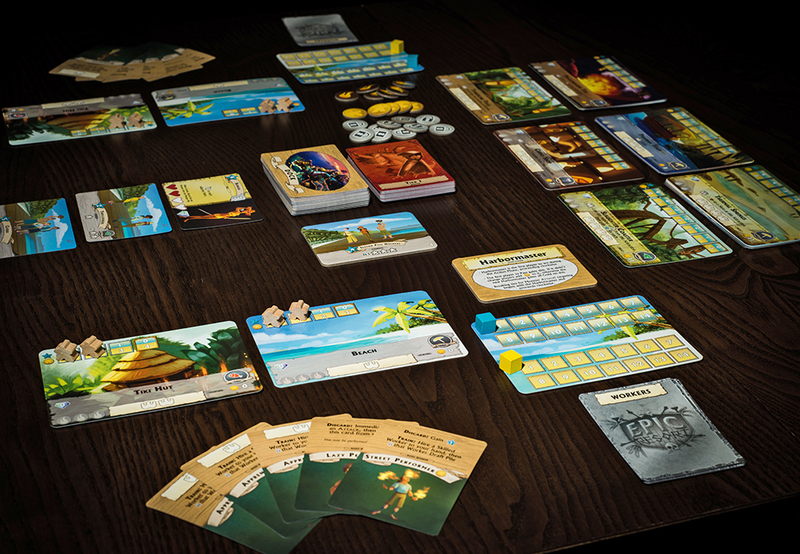 After that you get a combination of the two main resources of the game: flair and gold. Flair is used to attract more tourists and heroes, while gold is used for buying new attractions and getting better workers. But you’ll never be able to get lots of both resources in the same round, since the more gold you get the less flair and vice versa (it all depends on how many tourists you have). After this you each take turns doing lots of different things, including training your workers and upgrading your attractions for gold, attracting heroes or tourists for flair. After everyone has passed then the glorious madness starts. Monsters start attacking, but you never know where (though they will target people in the lead), how many, and what attractions they will attack. You can direct your heroes to either move over to battle the monsters (but they will take damage and could potentially get killed), or move them away to save them (they are there to relax from all this monster slaying after all). The monsters will kill of the tourists and possibly damage your buildings, so it’s all about what you want to save and how much to want to put your heroes at risk. The game ends when the deck of monsters run out, so you can never be completely sure when that happens. This is a fantastic game. It’s a blast to play, has a theme that really shines through and beautiful art. Some people not like the “chaotic” aspect of the way the monsters attack, but to me this just adds more to the fun of it. Another great thing is that you only use a subset of the workers each game, so you can changed that around to make every game feel different. This is one of the games I’ve had the most fun with, ever. It’s such a blast to play, monsters coming along and messing everything up and the heroes that you can either throw into the battle or try to save. The fact that the game targets the players ahead makes this even more brilliant. The balance of gold and flair is also a very interesting and fun idea. The theme of the game works so well with everything, it’s clear that everything is build up around the idea of the game and they feel like the perfect fit. Every thing from point scoring for the heroes and the attractions to the way the workers are handled makes perfect sense. The game looks fantastic, the stunning art done by Jacqui Davis really makes the silly and fun theme come to life. The rules are well written and easy to understand, with many images. It’s also laid out very well and includes a summary.